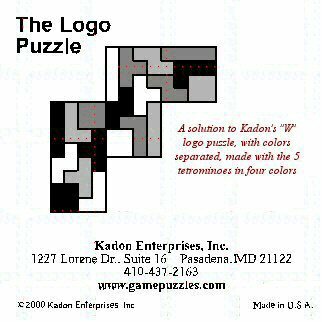 For Kadon's 20th anniversary in the year 2000, Kate designed a special commemorative "Logo" puzzle, dividing the famous W pentomino into 20 parts. It was a limited edition of 250 sets, each set numbered and often personalized. A small group were given out as gifts to our shareholders, staff, inventors, and very important supporters. The remaining sets were available for $20 each while they lasted and were discontinued in October 2004. 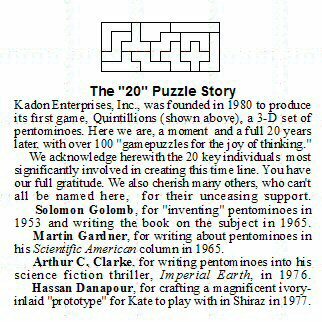 The 20 pieces were the 5 tetrominoes, each in 4 colors, and there were 20 challenges and 20 figures. The tray was the size of a standard CD and came packaged in a CD jewel case. 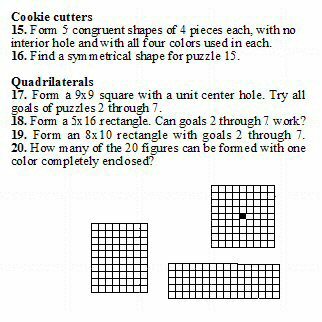 Because the pieces were so tiny, we supplied a little suction tool for manipulating them. 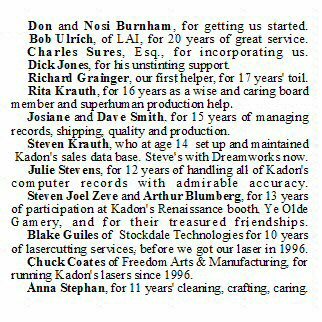 The booklet acknowledged by name the 20 key individuals who had helped us along those first 20 years. 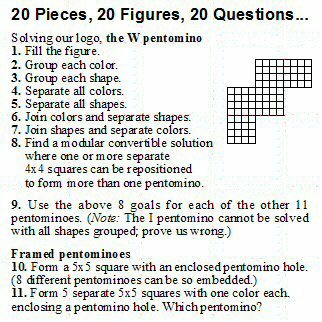 The pages of the booklet are reproduced below. It had been printed on ivory-colored textured stock, a single sheet folded to the size of the CD case to produce 8 pages. 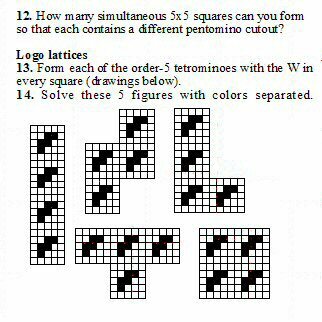 Now folding that sheet was a puzzle in itself... Here they are in the right order. 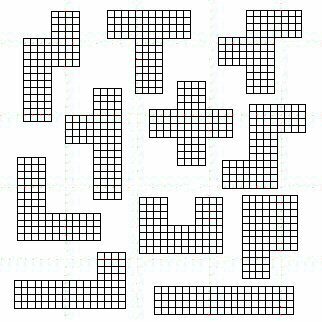 Toby Gottfried has a nice collection of interesting solutions his computer program has found to do with these 20 pieces. Take a look.